Child marriage violates girls’ basic human rights. When girls are forced to marry, they often drop out of school, may face serious health complications and even death from early pregnancy and childbearing, and are at greater risk of HIV infection and intimate partner violence. And they are often isolated, with limited opportunity to engage socially and to participate in the economic development of their communities. Be sure to check out our web page including our research findings, publications and media articles: click here. While there is a growing evidence base documenting the tragic consequences of child marriage, there is a lack of data that sufficiently demonstrates the economic impacts of this harmful practice, including the economic opportunity and financial costs, costs for health care systems, lost education and earnings, lower growth potential, and the perpetuation of poverty. Through this project, ICRW is collaborating with the World Bank (funded by Children’s Investment Fund Foundation) to lead this unique three-year program, which aims to address the economic consequences of child marriage through research, capacity building and advocacy. By establishing the effects that child marriage has on economic outcomes, the project aims to catalyze greater attention to this issue and accelerate progress to end this harmful practice. In the first phase of work, ICRW and the World Bank developed a conceptual framework that has guided the research. The team then carried out a desk-based review of existing research and evidence on the pathways identified in the conceptual framework. Secondary data analysis is being conducted using large data sets, which include relevant information to develop preliminary estimates of economic costs of child marriage. The final phase, now underway, involves primary data collection and analysis for three countries with high child marriage prevalence rates. The project will include global and national level advocacy components, as well as capacity building for local organizations and governments in the target countries. 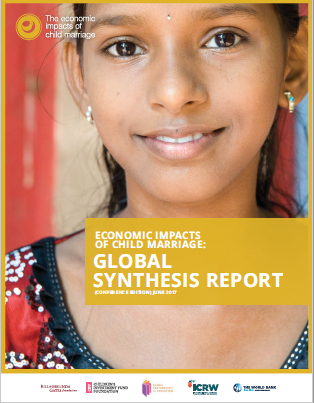 For our research findings and a comprehensive compilation of related publications, visit https://www.icrw.org/publications/economic-impacts-child-marriage/.